Home Refinancing options are used in many different ways for the existing property. 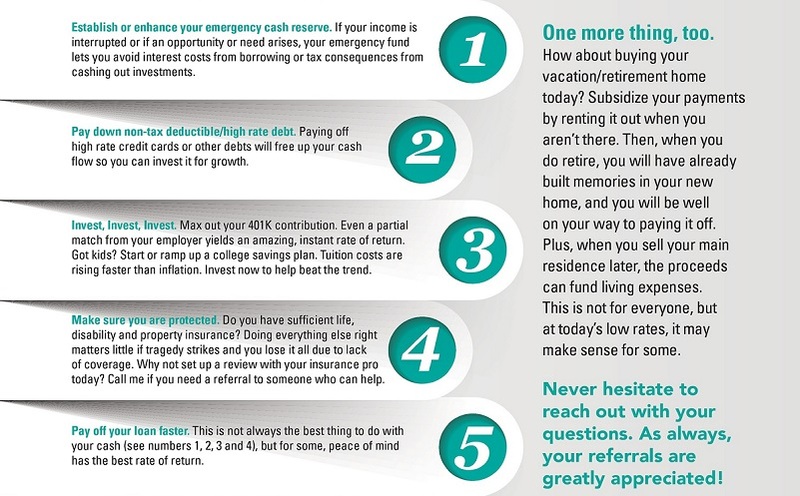 Lowering the monthly payment, cashing out some of the equity in property or getting different terms on the loan are a few examples refinancing gets utilized. Mortgage Refinancing can help home owners in many different ways to save money, interest or use their equity to pay off other debts. The Home refinancing process is very similar to buying a house and beside some of the fees being different, most of the loans go through processing and underwriting with the lender. One of the most important factors to refinance your Mortgage is to know the client’s financial plans and goals in order to offer them an appropriate term and option. As much as rate and fee shopping is important, we do encourage our clients to look at the overall picture of their loan as far as future equity, term, the interest paid and the length of recouping the fees charged as well. Getting a lower interest rate and lower monthly payment. Eliminating the private mortgage insurance by using the existing equity. Changing the term of the current loan to a fixed, shorter or longer term. Cashing out existing equity to pay off other debts or cash on hand for any special situation. Mortgage refinance option can take place at any time during the term of your loan. You can also change the type of loan you have to a different qualifying loan to get a better term, rate, and overall option. Offering a variety of mortgage refinance options. Offering much lower fees and rate. Fast underwriting and approval process. Knowledgeable loan officers who can get you to the right loan. USA Mortgage’s Columbia, Missouri branch has the resources needed to make your dream a reality. If you are ready to move forward with mortgage refinance, contact us to get started.